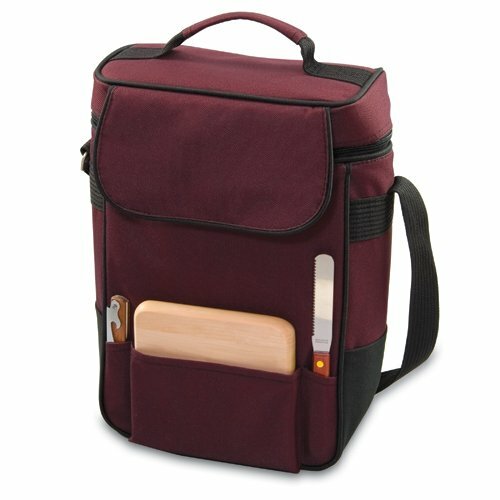 When a full picnic is too much, the Duet is the perfect wine and cheese tote you can take anywhere. It's an insulated tote made of 600D polyester in burgundy with black trim that has 2 compartments for wine. It comes with wine and cheese service, including a hardwood cheese board (6 x 6in), stainless steel cheese knife with wooden handle, and a stainless steel corkscrew. The adjustable shoulder strap makes it easy to carry. Convenient and practical, the Duet is perfect for wine and cheese lovers. A wonderful gift idea!